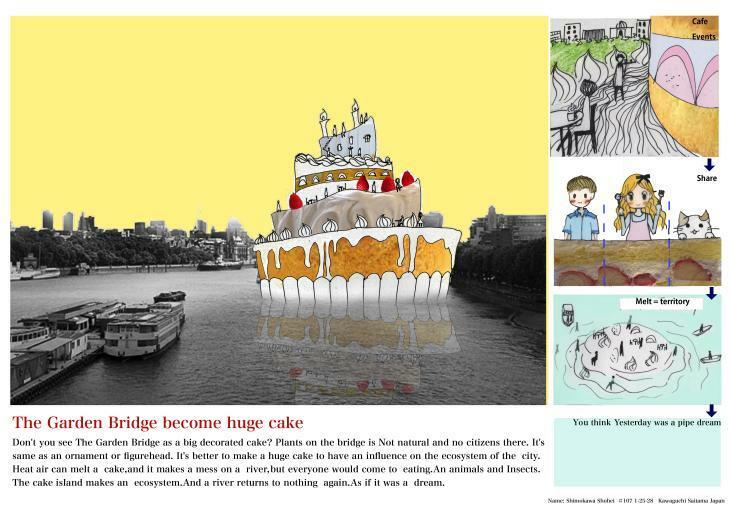 A Bonfire, Cake Or Giant Scrotum: Better Than The Garden Bridge? 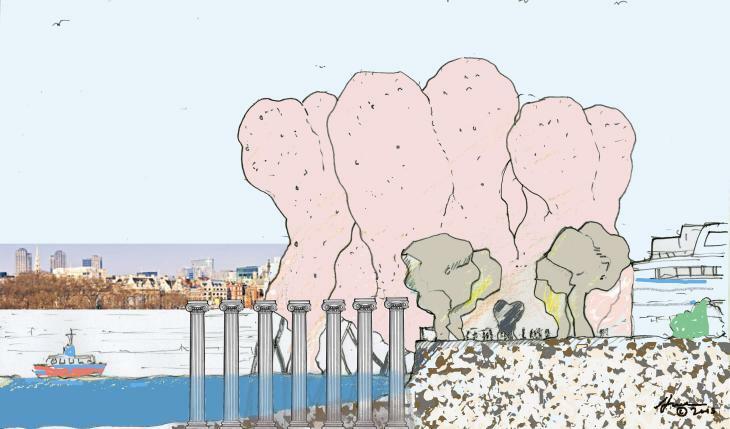 Rachel Holdsworth A Bonfire, Cake Or Giant Scrotum: Better Than The Garden Bridge? 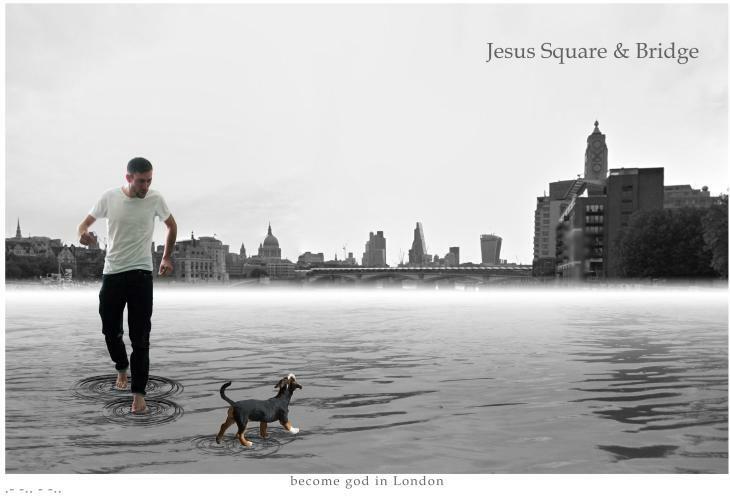 The winning design by Ben Weir. How about a bonfire instead of the Garden Bridge? It's the winner of a competition-slash-political protest-slash-satire of Joanna Lumley's pet project. 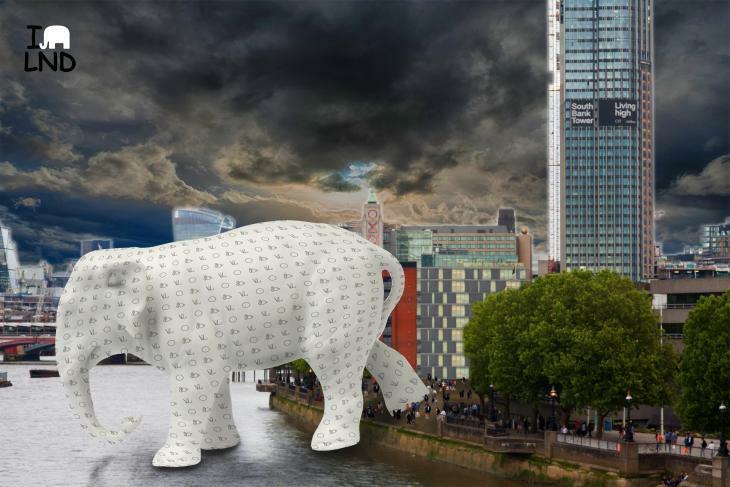 The people behind A Folly For London wanted to highlight the absurdity of the planned bridge over the Thames, which is swallowing public cash yet won't always be accessible to the public (and is really more tourist attraction than sensible infrastructure). So why the bonfire? Designer Ben Weir calls it an 'eternal flame dedicated to 21st century planning departments and developers' mounted on a pier in the river, kept burning by removing trees from London's parks and green spaces. Those spaces would, in turn, be used to build luxury flats. 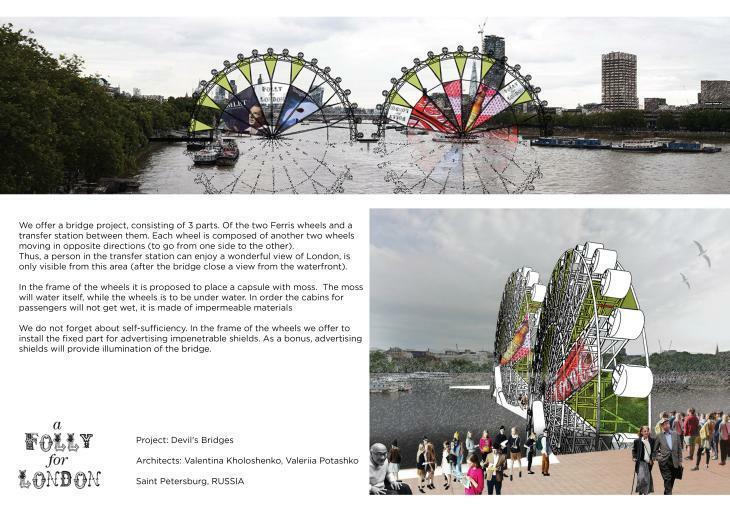 The judges, who included politicians from all four main London parties, artists, comedians, architects and designers, also awarded kudos to entries that highlighted greenwash, absurdity in infrastructure and — crucially — priapism. Weir, as overall winner, gets to keep satirical cartoonist Martin Rowson's entry. "Given that the Garden Bridge is the sort of whimsical, thoughtless project you’d expect a slightly dim architecture student to reject, and given that it is now to be backed up with enormous quantities of public money, these proposals gave exactly the correct response — full of scorn, humour and imagination. May they shame the Garden Bridge out of existence." You can see some of the designs below, or see them all at an exhibition at St John's church in Waterloo, 24 September-4 October. What's The Point Of The Garden Bridge? Huge Cake by Shimokawa Shohei, Greenwash joint winner. Bulb, by Anthropophagic Architecture Anonymous: second runner up. The Bulb aims to solve London's housing crisis by evicting 200,000 social housing tenants and rehoming them in a 24 hour live housing exhibition, using a "neoliberal sharing economy... Each resident will share everything, from the socks to the kitchen (no privacy provided, 3.15sqm average per person)". 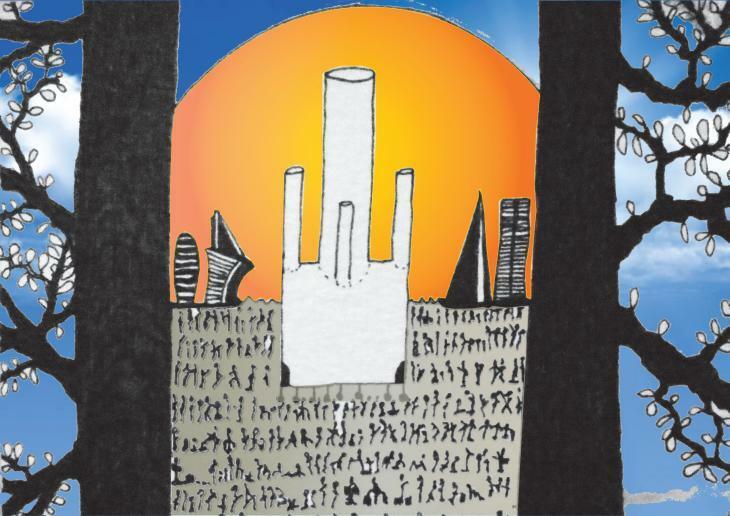 Scrotopolis by Huren Marsh. Honorary mention for priapic humour. Francisco Rocha takes a literal view. 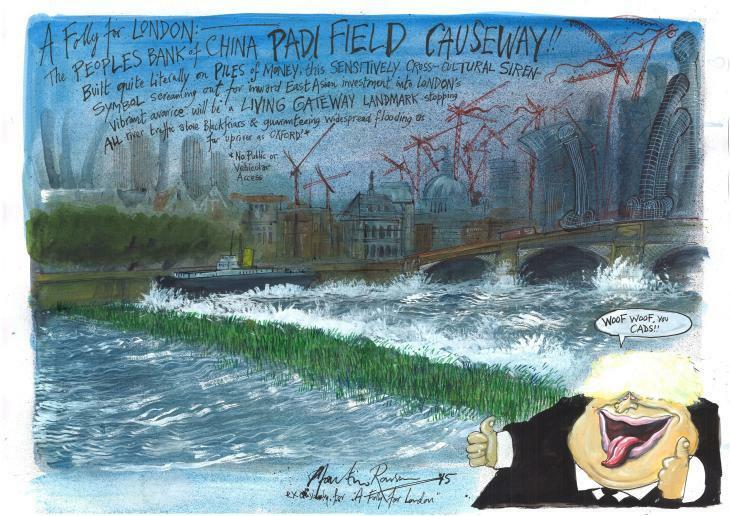 Cartoonist Martin Rowson's take -- this artwork is also the winner's prize. Jesus Square and Bridge by Andrius Daujotas & Tautvilė Džiugytė: honorary mention for absurd transport infrastructure. "The main idea is to put the enormous amount of taxpayers' money to something you cannot even see." Devil's Bridges by Valentina Kholoshenko and Valeriia Potashko; another honorary mention for absurd transport infrastructure. The Bifrost Bridge by Charlie Plumley, Greenwash joint winner. 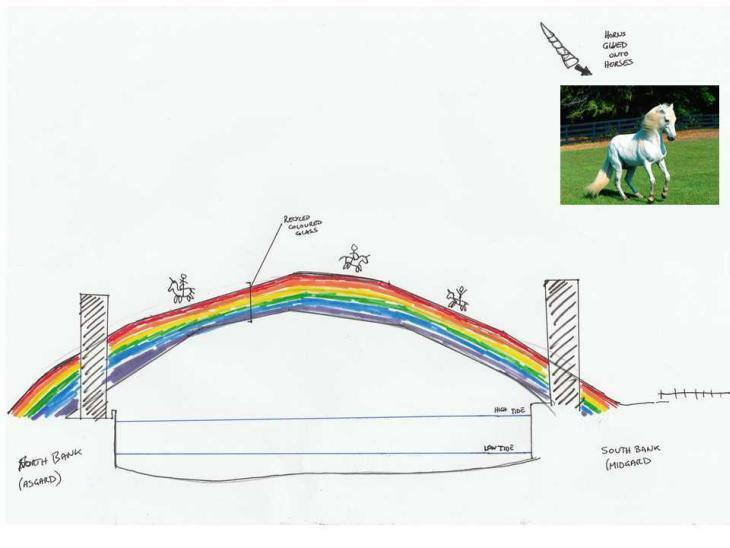 Londoners will cross the bridge, made from rainbow-coloured recycled glass, on unicorns.